I didn't have a star to go on the top of my Yule tree, so I decided to make one myself - and you can see it in the photo. To make it, I used five thin wands of wood I had trimmed from a forsythia hedge in my front garden earlier in the year. 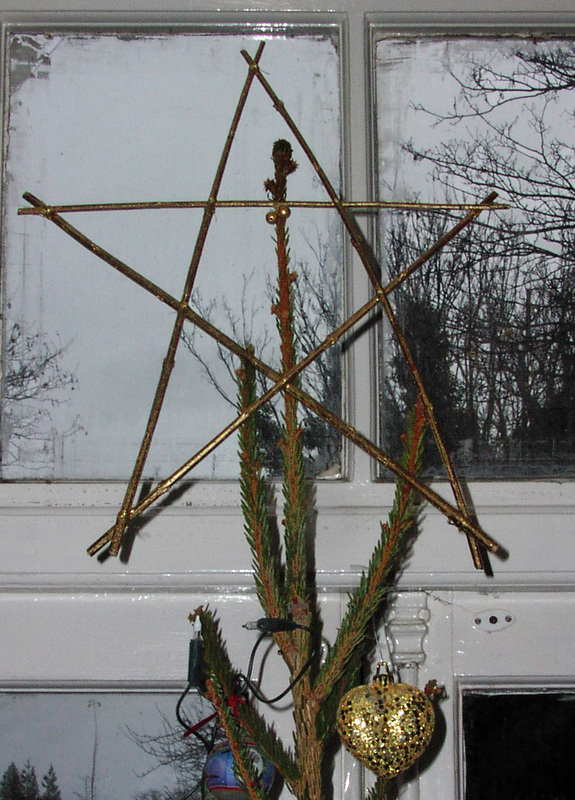 I cut them to length, laid them out in the shape of a five-pointed star, tied thread tightly at the joining points, then painted the star gold before fixing it to the tree with a little bit of wire. If you made one, you could decorate it further with ribbons or wrap tinsel around it. I quite like mine plain. A five-pointed star formed of five straight lines is called a pentagram (a pentacle is a five-pointed star surrounded by a circle). Both are sometimes used as symbols of faith by Wiccans, because the five points represent the four elements of earth, air, fire and water plus the fifth element of spirit. As Dan Brown famously pointed out in his novel The Da Vinci Code, the pentagram also represents Venus and is a symbol of the goddess, because the planet appears to move in the form of a five-pointed star in the night sky. I really like that. It is nice you made it yourself, it pretty much more when it do it that way.